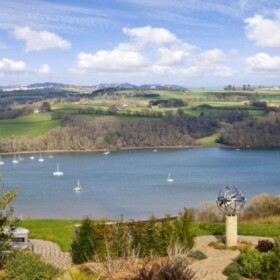 A breathtaking house with stunning views over the River Dart. 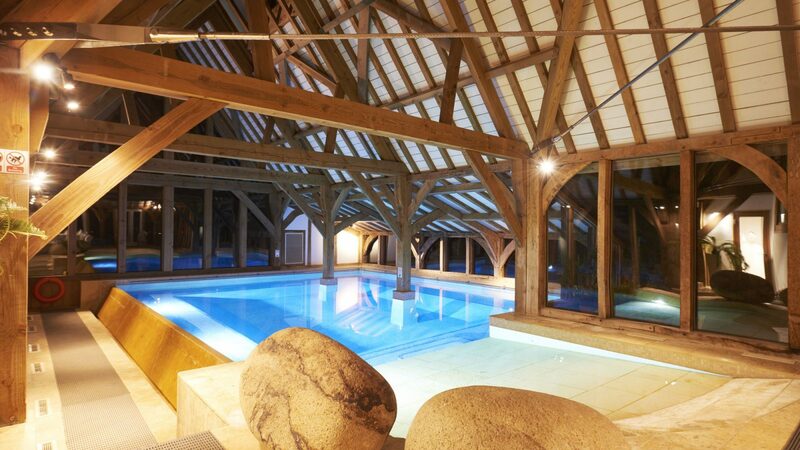 A gorgeous indoor pool. Hot tub. Fire pit. 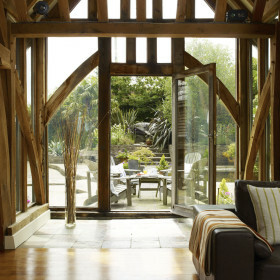 Arching oak beams and serene bedrooms. This mind-bending, 14-guest property has inspired pop songs, created life-changing special occasions and given scores of children unforgettable holiday memories. 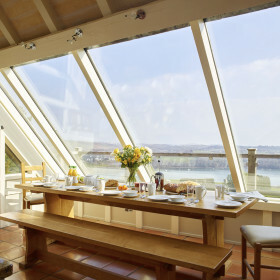 The spaces are colossal, the river views stupendous, the cathedral windows and oak beams designed by architects of Grand Designs fame. 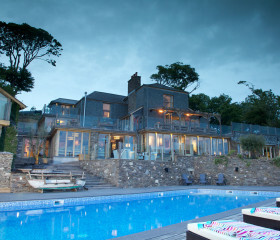 Their vision conceived a peerless study in contemporary Devonshire beauty. The splendour adds to the family fun. You can enjoy those views from the hot tub and the fire pit. 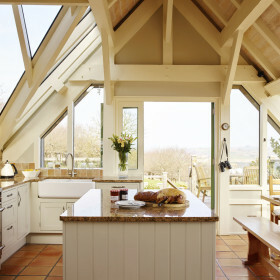 And the kids will love the secret attic playroom. Stay in the Zen Suite for the spa room. 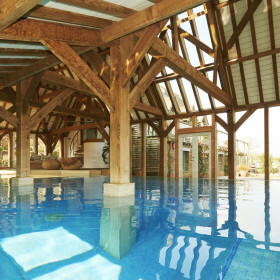 Try the Aqua Suite to slide swiftly into the spectacular indoor pool. Wherever you stay, the Lamper Head experience will stay with you. Does the dawn of a new day ever promise so much? Slide from your ensuite master bedroom straight into the heated pool, slink into the dressing area, then throw back the doors to the Mediterranean courtyard and enjoy continental breakfast as the morning sun dries your hair. The day will continue to unfurl its delights. Rejuvenate yourself with visits from massage and beauty therapists in the spa treatment room. 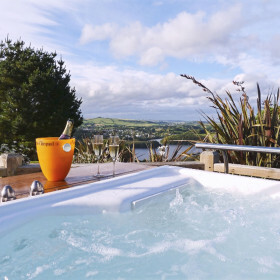 Melt your cares away in the hot tub as you take in the river views. Stroll the grounds after family supper, before your final dusk swim in the soft light of another delightful Lamper Head evening. Your break might last only a few days, but the magic lingers forever. 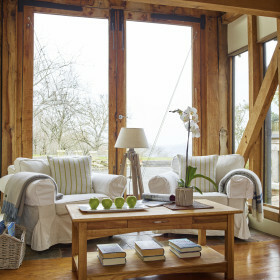 In Lamper Head, architects have created glorious contemporary oak-beamed minimalism. 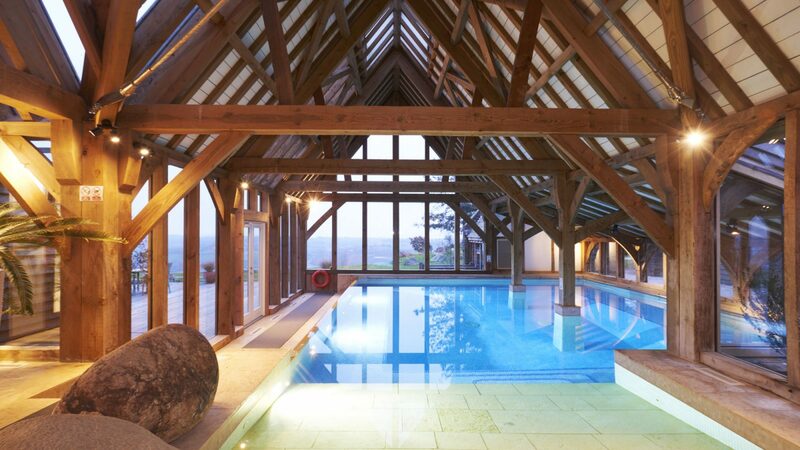 At the heart of the opulence, the barn with its magnificent heated indoor pool offers glorious rural views. The huge open plan living and dining room is full of light. The balconies and terraces were made for soaking up the views and star gazing. Pick a book from the library to curl up with after your swim, sip cocktails in the bar area and sit down to a sumptuous feast at your oak dining table. 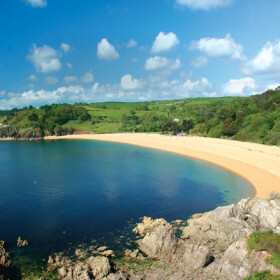 And all around you the glorious Devon views will lift your spirits. Flow is everything here. Lamper Head is a festival of reception rooms and outside terraces. 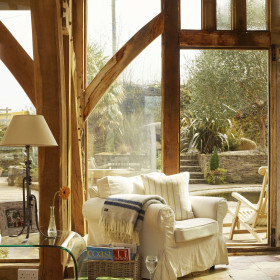 Big doors open wide, inviting the outside in, and the inside out. 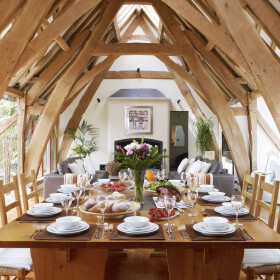 Amid the double-height ceilings, the oak beams and the cathedral windows, serenity abounds. 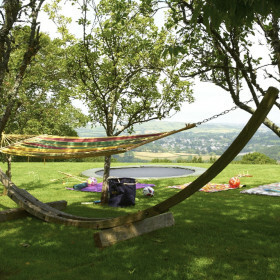 Whether you’re sunbathing, stormwatching or searching for yourself, you can do it all knowing the kids are having a great time, too, in the secret playroom, the pool or the endless acres outside. 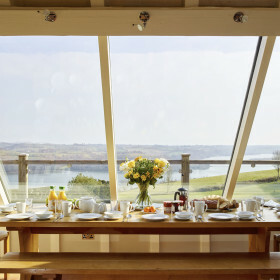 Vast swathes of glass make for lighter cuisine. Indulge, or be indulged by our expert chef, in local seafood or organics, then savour every morsel on the terrace that gazes in wonder over the Dart. 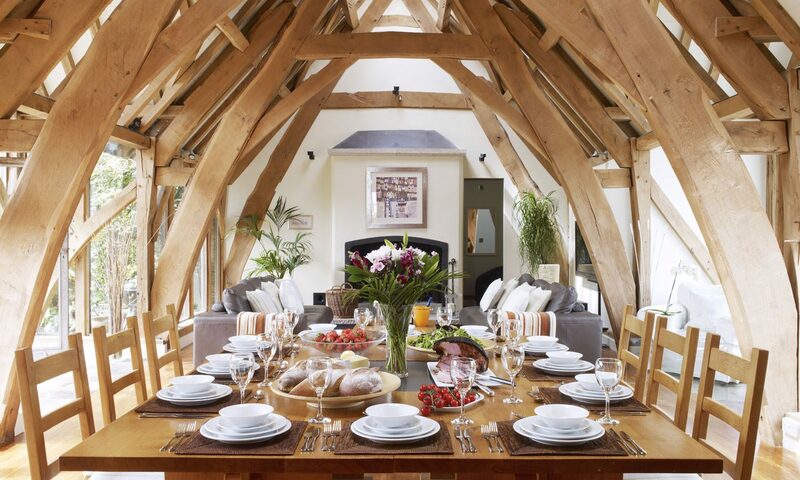 Gather up to fourteen friends and family around the oak dining table in the main dining hall. 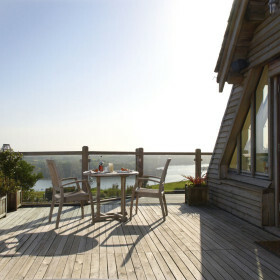 Enjoy alfresco meals and BBQs on the terrace and take in the outstanding views. A fantastic chef is available for that special meal or throughout the whole weekend. 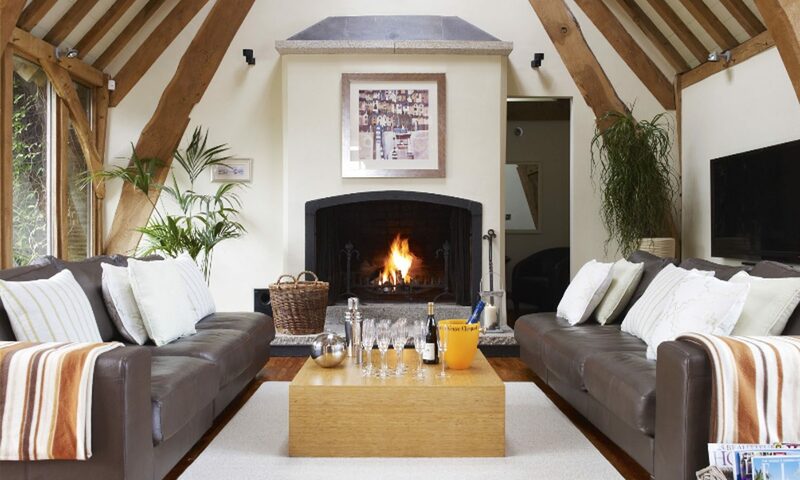 Lamper Head is a food-lover’s paradise with local seafood, organic produce and Devon treats all available. Save time and order some delicious drop-off meals and an online food delivery, so you can just sit back, relax and enjoy your dining experience. 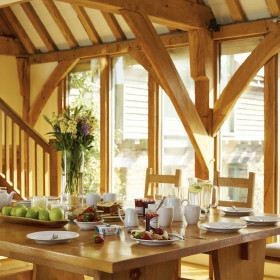 With fantastic restaurants nearby dining out is a real treat at Lamper Head. 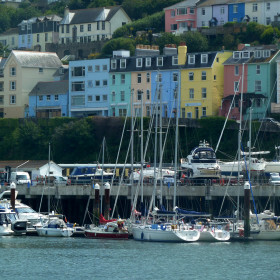 This place is heaven for foodies, brimming over with gourmet restaurants, inns and cafes from the Michelin-starred Angel in Dartmouth to Riverside Organic’s field kitchen and Mitch Tonk’s Rockfish – a fish and chip shop like no other! 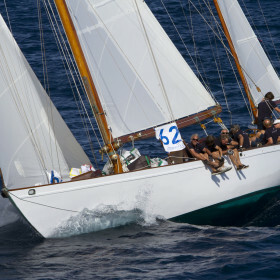 For a special treat charter a yacht and enjoy the finest seafood on board. Aqua cool or Zen calm? Sleeping twelve to fourteen, the seven bedrooms exude oaky, vaulted beauty. Recline in your spa bath and stargaze through skylights. Watch the kids explore the playroom. Take the spiral staircase to balcony river views. 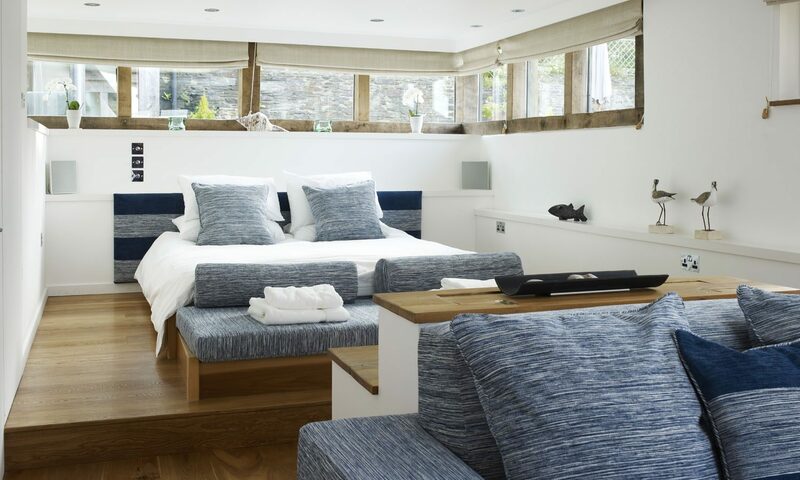 The ground floor Zen suite is a spacious bedroom suite with a luxurious ensuite master bedroom and a sitting area. 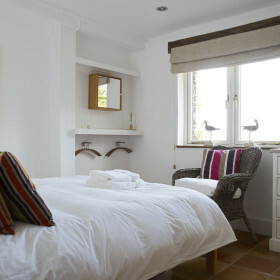 The first floor Aqua suite has a wonderful master bedroom, an ensuite bathroom on the second floor and a dressing area. 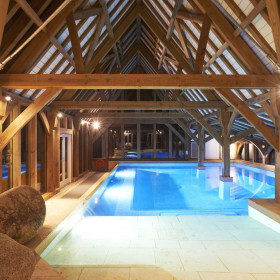 Enter the pool straight from your bedroom for an early morning dip or a swim after dusk. Lie back and relax in the sunken bath and star gaze through the skylight. There is a further ground floor double bedroom and two lovely twin rooms on the ground floor, with use of the family bathroom and the ground floor shower room. 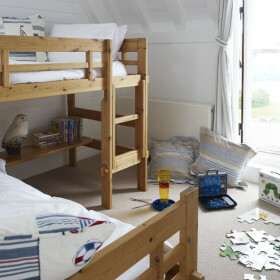 There is one bunk bedroom and a characterful single cabin bedroom for children with wonderful views. 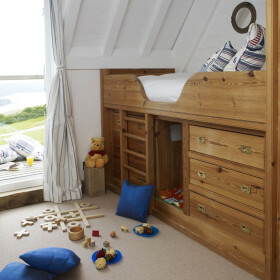 Children will love the bunk bedroom with access to the secret attic playroom. The cabin bed is also suitable for adults. 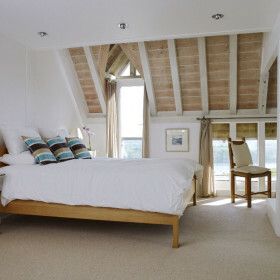 Two guest beds are available to give you more flexibility in your bedroom arrangements. 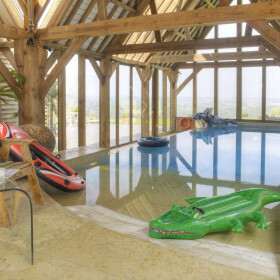 Memories are made of a heated indoor pool, secret attic playroom and five acres of hide-and-seek garden. 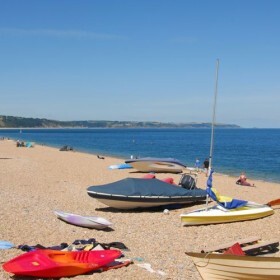 Local attractions, like beaches, the zoo and the leisure park, make for happy families. The heated indoor swimming pool is great for children with a sloping beach style pool deck which gradually slopes beneath the water. This will keep them happy all year round. 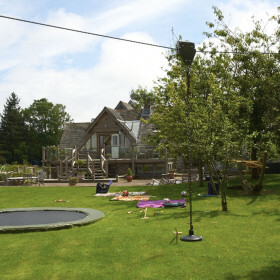 With bags of toys and games, their own beanbag-filled space in the secret attic playroom and five acres of gardens to explore, chidren are in heaven here! Sailing. Fishing. Catching crabs in rock pools. Indulging. If you can leave this stupendous house, Dartmouth and beaches and await. 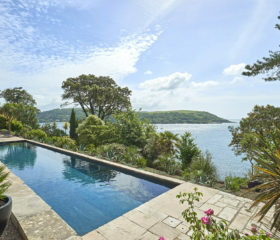 Summon the willpower and open the front door on canoeing, kayaking, sailing, golfing and happy pottering.